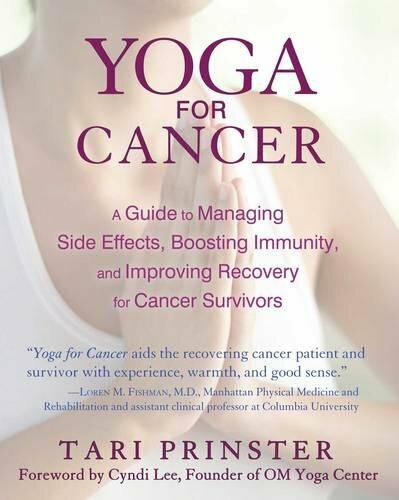 “A cancer diagnosis changes your life in an instant,” says author Tari Prinster in Yoga for Cancer: A Guide to Managing Side Effects, Boosting Immunity, and Improving Recovery for Cancer Survivors. This is straight talk from someone who knows. In Yoga for Cancer, Ms. Prinster effectively demonstrates why and how to use yoga to cope with cancer and cancer treatments, to lessen treatment side effects, and to enrich patients’ lives as they regain and maintain their health. Her Yoga4Cancer (y4c) methodology is based her personal experience as patient, survivor, and yoga teacher; Western scientific principles; insights from Eastern traditions; and all that she has learned from her students and other yoga teachers. Yoga for Cancer begins with a discussion of the immune system and how it works. The science of cancer and the benefits of yoga at a cellular level are topics not usually discussed in yoga texts or classes. Ms. Prinster’s book is easy to read as she transitions from topic to topic, from cancer diagnosis, navigating through treatments, and survivorship. Her advice for readers: be curious, ask questions, demand answers, learn patience. She states, “. . . cancer steals the breath, clouds the brain, and weakens the body.” These subjects can be uncomfortable, and Ms. Prinster’s frank discussion of the logistics and emotions connected with treatment are offered with a positive and uplifting approach. With or without cancer, a body without movement/exercise stagnates, becoming dull and weak. Ms. Prinster says, “Yoga can be defined as a way to position the body for the purpose of practicing patterned breathing and movement.” Yoga for Cancer focuses on the interconnection of body systems, whose functions can become affected when treatment targets only selected body parts or types of cells. The y4c method includes movements that are slow, gentle, and supported, with appropriate cautions about poses that should be avoided. The five principles of y4c are consistent with the koshas (sheaths of the human system) described in traditional yogic teaching. Yoga for Cancer presents seven building blocks for creating a healing practice: how to sit, breathe, and quiet the mind; how to move with ease, then actively rest; how to build focus, bone and strength; and how to seal in all the benefits of the practices. The book provides excellent B&W line drawings along with brief, clear instructions for approaching and releasing 53 poses including warm-ups, standing poses, balancing and restorative poses. Readers will also learn the benefits of each pose, the props that are needed, helpful breath techniques, and modifications. Yoga for Cancer continues with sample sequences for practicing in 30-, 60-, or 90-minute sessions, during various stages of cancer experience: treatment, recovery, gaining new strength, and maintaining the new normal (performing daily tasks without discomfort or frustration). There are also 10 suggested sequences for addressing specific side effects. Answers to FAQs appear in sidebars throughout the book. Detailed footnotes are helpful, citing sources and providing recommendations for further reading. Several survivor stories are included. The yoga poses and movements are identified in a variety of ways: by Sanskrit name, by English version of the traditional name, and by descriptive names. When Sanskrit terms are used, they are explained in the text. Yoga for Cancer is well researched; the book concludes a list of the resources that the author used, along with a complete bibliography and index. A brief list of books of related interest is also included. Yoga for Cancer sets out to help people live longer, healthier and happier lives. Writing it is a loving act of kindness by Ms. Prinster. This book is highly recommended for cancer patients and survivors, caregivers, and yoga instructors.